Do you ever wonder if you’re getting enough exercise? Are you worried that you don’t burn off more calories than you take in? Are you simply curious as to how many steps you take in a day or how many miles you walk just doing your average routine? 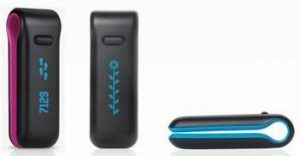 Well, you could get yourself a pedometer, or you could really treat yourself and get a Fitbit Ultra Wireless Activity Tracker (Retail $99.95) and have a product that goes above and beyond what any run of the mill pedometer could deliver. Just wear this lightweight little device throughout the day and night to gage a variety of information, from steps taken to sleep quality, then upload and analyze the results to your personal page at Fitbit.com. Use this information to track your activity levels, help you meet your exercise goals, and motivate you to be a healthier you. The device itself looks a little like a stylish black money clip, with your choice of an interior color of either blue or plum. You can slide it onto your waistband, the center of your bra, or place it in your pocket, though the results will not be as accurate from your pocket. For thicker waistbands or belts, you get a convenient holster clip, and for nighttime comfort, you get a soft fabric wristband to sleep in. The Fitbit Ultra is so lightweight and unobtrusive that you’ll forget you are even wearing it. In fact, during my days of testing this out, I found myself putting my hand down to my waist every few hours just to make sure it was still there. You control the tracker with one simple button on the front. This allows you to start and stop the timer for when you want to precisely mark the beginning and end of either an activity or a sleep cycle. You will also use this button to check battery life, or to scroll through the list of information the device is tracking. You can easily view this information on the digital readout directly beneath the button on the front. The Fitbit Ultra will tell you how many steps you have taken, how much distance you have covered, how many flights of stairs you have climbed, how many calories you have burned, and will also display the time. You can set the device to periodically greet you by name and give you motivational messages to keep you inspired throughout the day. You can also view a little digital flower on the display, as a graphical depiction of how active you are. The taller the flower gets, the more active you’ve been. Continue to be active through the rest of the day to keep your flower from shrinking. 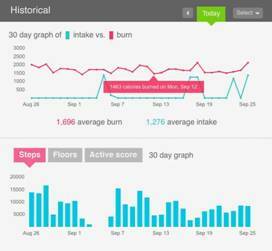 When you sync your device up to the Fitbit.com web site, you’ll have access to even more information. Whenever your tracker is in range of its docking station, provided the station is hooked up to your computer via USB, it will automatically sync its data every 15 minutes. You can also manually sync by placing it on the docking station. This will also charge the tracker. A full charge will last a week, which is also the storage capacity for the device. You can still sync information after one week, but the results will not be as detailed. 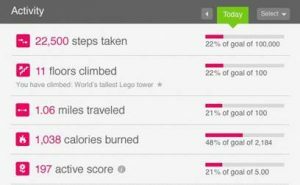 Once you have synced your Fitbit Ultra to the site, you can start browsing the results of your activity tracking. You can view all of the data that you could see on the digital readout of the device, plus view how long and how well you slept. You can also input your height and weight to aid in calorie burning calculations, and log your food intake each day. See the data from just one day or look at charts and graphs of the entire week or even month to compare your results day to day. When looking at one day at a time, you can see a timeline of how your activity was spread out hour to hour. You can set goals for yourself, earn achievement badges, and connect and compete with friends in the online community. Friendly competition as well as being awarded badges will keep you motivated and coming back for more. 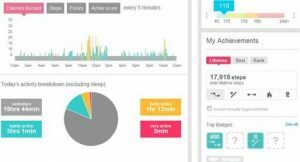 Being able to see all of your activity stats in one place, and presented in such a detailed and comparative way, is really helpful in understanding where you might need improvement, or where you are doing well. I was astonished to find out how many miles I walk in just an average work day, and similarly appalled at how many sedentary hours I spent on my days off.